Uniformitarian scientists derive many more ‘annual layers’ in the Greenland ice cores than creationists because of their assumed old age time scale. The differences between the two paradigms also show up in the interpretation of the Ice Age portion of the cores. Large changes in oxygen isotope ratio are interpreted by uniformitarian scientists as wild fluctuations in temperature in the North Atlantic region. Such wild fluctuations in the previous ‘interglacial’ sparked a reinforcement syndrome and other such fluctuations were then ‘discovered’ in other data sets, such as deep-sea cores. These ‘interglacial’ fluctuations have been used to justify speculation on rapid climate change in the present climate due to increased greenhouse gasses. The ‘interglacial’ ice core fluctuations are now seen by most scientists as an artifact of ice flow. Uniformitarian scientists are still perplexed over the huge Ice Age fluctuations. Creationists, on the other hand, can interpret the oxygen isotope swings in at least four ways by events within a short post-Flood Ice Age. The oxygen isotope fluctuations could represent seasonal changes, longer period climate changes caused by variable volcanic dust loading, changes in sea ice, or atmospheric circulation changes. Figure 1. The oxygen isotope ratio down the GRIP ice core, central Greenland (from Wolff et al. ).5 Within the uniformitarian interpretation, Holocene represents the last 10,000 years or so, YD is the Younger Dryas cold period, A/B is the Allerod/Bolling warm period, 5a–d is the early part of the last ice age, and ‘Eem’ represents the previous interglacial. In the creationist interpretation, the Holocene would represent the post-Ice-Age climate during the past 4,000 years (approximately 1,500 m of ice), while the rapid post-Flood Ice Age would include the whole core below 1,500 m depth. Notice the high amplitude sharp oscillations in the oxygen isotope ratio in the glacial part of the core. On the other hand, creationists base their interpretation of the Greenland ice cores on a rapid, 700-year-long, post-Flood Ice Age followed by the present climate. In this model annual layers would be much thicker in the Ice Age portion of the ice sheet, and the claimed uniformitarian annual layers would be subannual, even picking up individual storms. Figure 3 in my Countering the Critics article1 contrasts the difference in annual layer thicknesses down the core in the two models. Figure 1 shows the oxygen isotope ratio down the GRIP core5 with both the uniformitarian and creationist interpretations of events.6 The oxygen isotope ratio has been generally correlated to temperature,7 the colder the temperature the more negative the oxygen isotope ratios. Thus, the Ice Age portion of the core is the lower 1,500 m. Notice that the oxygen isotope fluctuations during the Ice Age have significantly higher amplitude. These Ice Age fluctuations and their interpretation, as well as the uniformitarian implications for future climate change, are the subject of this article. The wild Ice Age fluctuations reveal serious problems with the uniformitarian interpretation. Because of the rapid changes in oxygen isotope ratios, uniformitarian scientists now are forced to believe that the temperature on Greenland changed up to 20°C in periods as short as 1 to 3 years!8 This is a radical interpretation, but they are forced to accept it anyway, because of their assumptions. Since these changes are believed to represent the climate around the North Atlantic Ocean,9 wild back-and-forth climate fluctuations are assumed for this area. What kind of processes could possibly account for such radical changes, even during the Ice Age? The scientists are desperately searching for some sort of mechanism that would cause such catastrophic climate changes. The fluctuations are more an indication that the uniformitarian interpretation is faulty. This sudden discovery of radical climatic fluctuations in other data sets and their equally sudden questionable nature for the previous ‘interglacial’ seems to be another example of the ubiquitous reinforcement syndrome.13 It seems that the uniformitarian view is most accommodating to radically different interpretations. So, a warming climate can lead to a drastically cooler climate, according to uniformitarian thinking. The main mechanism proposed for such radical climate change, past and future, is the stopping of the Atlantic Ocean circulation so that warm water is not transported northward to Greenland and Europe.16 This mechanism, initiated by an increase of man-made CO2, seems far-fetched. How would creationists interpret the large-amplitude fluctuations during the Ice Age portion of the core? Since annual layers are much thicker in the creationist model, it is possible that the high amplitude oxygen isotope fluctuations are annual layers. However, some of the fluctuations would have lasted more than a year, since some of them are about 50 m thick. A second possibility is that these longer-lasting fluctuations could reflect variable volcanic dust and aerosol loads in the stratosphere. Figure 2 presents the postulated post-Flood volcanism up until glacial maximum.18 Notice the see-saw tendency superimposed on a gradual decline. During higher volcanism (the peaks), temperatures would be colder for a number of years. This could correspond to the more negative oxygen isotope values from the Greenland ice cores. Warmer periods would be caused by a thinning of volcanic dust and aerosols in the stratosphere. A third possibility is that changes in sea ice, which affect the oxygen isotope ratios, could cause the fluctuations.19 A higher amount of sea ice will cause more negative oxygen isotope ratios and vice versa. I see this process operating late in the Ice Age, since it would take quite a while for the warm ocean after the Genesis Flood to cool enough for sea ice to form.20 But this mechanism could be responsible for the late Ice Age Younger Dryas and Allerod/Bolling fluctuations. A fourth possibility is that the wild fluctuations reflect a changing atmospheric circulation, likely related and reinforced by any of the above three mechanisms. This is because temperature is only one variable out of many that affect the oxygen isotope ratios.7,21 Uniformitarian scientists usually interpret the oxygen isotope ratios mainly in terms of temperature fluctuations. The wild oscillations in the oxygen isotope ratio during the Ice Age is interpreted by uniformitarian scientists as catastrophic changes in temperature in the North Atlantic region. These are used to justify speculation on rapid climate change in the present climate due to increased greenhouse gasses. It is the uniformitarian stretched-out time scale that is the main cause of the problem. Within a creationist model,1 the large fluctuations can be explained by events during the Ice Age. With much thicker annual layers in the Ice Age portion of the core, the oscillations could simply be annual layers caused by seasonal changes in temperature or more prolonged changes in temperature caused by variable volcanic dust loading in the stratosphere. Interpretation of ice cores is another example where different assumptions, using the very same data, result in quite different conclusions. Keigwin, L.D., Curry, W.B., Lehman, S.J. and Johnsen, S., The role of the deep ocean in North Atlantic climate change between 70 and 130 kyr ago, Nature 371:323–326, p. 324, 1994. Return to text. 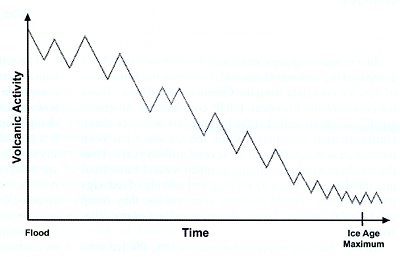 Lehman, S., Sudden end of an interglacial, Nature 390:117–118, p. 119, 1997. Return to text. Oard, M.J., The supposed consistency of evolution’s long ages, TJ 15(3):3–4, 2001. Return to text. Wolff et al., Long-term changes in the acid and salt concentrations of the Greenland Ice Core Project ice core from electrical stratigraphy, J. Geophysical Research 100(B8):16249–16263, p. 16252, 1995. Return to text. See Oard, Ref. 1 for the meaning of oxygen isotope ratios. Return to text. Dansgaard, W., The isotopic composition of natural waters with special reference to the Greenland Ice Cap, Meddelelser Om Gronland 165(2):7–120, 1961. Return to text. Hammer, C., Mayewski, P.A., Peel, D. and Stuiver, M., Preface to special issue, J. Geophysical Research 102(C12):26315–26316, 1997. Return to text. Haflidason, H., Sejrup, H.P., Kristensen, D.K. and Johnsen, S., Coupled response of the late glacial climatic shifts of northwest Europe reflected in Greenland ice cores: evidence from the northern North Sea, Geology 12(12):1059–1062, 1995. Return to text. Greenland Ice-Core Project (GRIP) members, Climate instability during the last interglacial period recorded in the GRIP ice core, Nature 364:203–207, 1993. Return to text. Oard, M.J., A tale of two Greenland ice cores, CEN Tech. J. 9(2):135–136, 1995. Return to text. Sarnthein et al., Exploring Late Pleistocene climate variations, EOS 81(51):625, 629, 630, 2000; p. 625. Return to text. Oard, M.J., Ancient Ice Ages or Gigantic Submarine Landslides? Creation Research Society Monograph 6, Creation Research Society, St. Joseph, pp. 11–13, 1997. Return to text. Taylor, K., Rapid climate change, American Scientist 87:320–327, 1999. Return to text. Calvin, W.H., The great climate flip-flop, Atlantic Monthly 281(1):47–64, 1998. Return to text. Broecker, W.S., Thermohaline circulation, the Achilles heel of our climate system: will man-made CO2 upset the current balance? 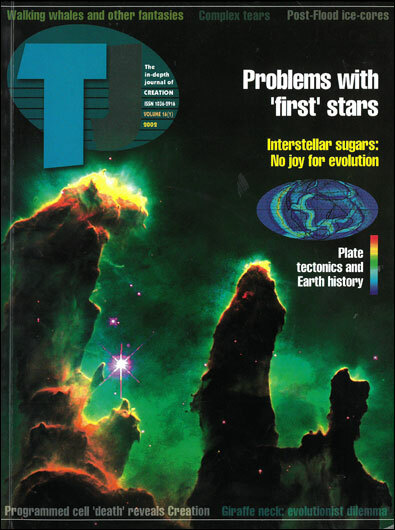 Science 278:1582–1588, 1997. Return to text. Sarnthein et al., Ref. 12, p. 625. Return to text. Oard, M.J., An Ice Age Caused by the Genesis Flood, Institute for Creation Research, El Cajon, p. 68, 1990. Return to text. Vardiman, L., Rapid changes in oxygen isotope content of ice cores caused by fractionation and trajectory dispersion near the edge of an ice shelf, CEN Tech. J. 11(1):52–60, 1997. Return to text. Oard, Ref. 18, p. 112. Return to text. Dansgaard, W., Stable isotopes in precipitation, Tellus 14:436–468, 1964. Return to text. Oard, Ref. 18, p. 68. Return to text.